The mourning dove (Zenaida macroura) is a relatively small bird found throughout the North American continent. In spite of being one of the most frequently hunted birds in the United States, large populations of doves thrive across the country. While they are considered wild birds, they are sometimes kept as aviary pets. Mature mourning doves generally reach a body length of 9 to 13 inches and can have a wingspan exceeding 17 inches. Despite their plump appearance, the doves have strong wings that produce a discernible whistling sound as they fly. Mourning doves generally prefer habitats with scattered or thin trees and brush with some open areas. They are commonly found along roadsides as well as in fields bordering forests and suburban areas. Mature doves produce a characteristic "coo" familiar to millions across the continent. Adults of both genders sport tan, brown and black feathers for camouflage. The onset of spring heralds the start of mating season for wild mourning doves. The male initiates the proceedings by slowly elevating himself with deliberate and heavy flaps of his wings until he's at least 100 feet up, after which he spirals to the ground and issues a mating call, according to Clemson University Cooperative Extension. It's not uncommon to spot groups of three doves, two males and one female, chasing each other around. The chase is a form of competition between two males. Single males may attempt to challenge males even after a male-female pair has been established. Mourning doves construct their nest in the days and weeks before laying eggs. Nest-building is actually a joint project carried out by both members of the pair. The male finds and recovers materials for the nest, including twigs and other plant debris, and hands them to the female as she puts her future home together, according to The Cornell Lab of Ornithology. Doves tend to lay clutches of two eggs at a time, but a single pair can produce up to six clutches during one mating season. 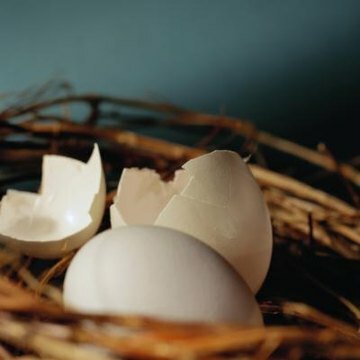 The eggs, which are less about an inch long and slightly less wide, hatch after about two weeks. Freshly hatched chicks are completely reliant on their parents for warmth, protection and sustenance. The parents feed their chicks through a process of regurgitation until the babies are old enough to fly and seek their own food. First-year mourning doves have a mortality rate of up to 75 percent, while adults have a better chance of surviving through a second year and onward, according to Wild Bird Watching. Mourning doves may survive for up to five years as long as they avoid predators, disease and accidental injuries. Adolescents who live past their first year are fully mature and participate in future mating seasons.